When dealing with rifling, each weapon will possess a series of family resemblances which will be present in all weapons of the same make and model. Correctly called class characteristics, they relate to the number of lands and grooves, their direction of twist, inclination of twist and their width. Class characteristics have been measured and technical information obtained for literally thousands of different firearms. These measurements have been compiled into vast databases and are commercially available for use either in table form or on a PC (Crime Laboratory Information System (1998); Mathews, 1962). By simply measuring the number, width and degree of rotation of the rifling grooves on a bullet, it is possible, with a fairly high degree of accuracy, to determine which make and model of weapon it was fired from. The spiral grooves which constitute the rifling in a barrel are there to impart a rapid spin on the bullet's longitudinal axis. The gyroscopic effect of this spin stabilizes the bullet, preventing it from tumbling or yawing during its flight, improving its accuracy. In the past, barrels were often rifled with a gain twist where the rate of twist increases from breach to muzzle. This is also referred to as progressive rifling. The purpose of gain rifling was to allow lead bullets to build up the rate of spin gradually along the length of the barrel. The sudden acceleration of the bullet at the breech end of the barrel could cause the soft lead to strip through the rifling and thus not acquire the correct degree of stabilization on leaving the barrel. This effect is called skidding. With modern lead alloys, jacketed bullets and progressive burning pro-pellants, this is not such a problem, and gain twist rifling is hardly ever encountered. One class of weapon in which the phenomenon of skidding is very prominent, however, is in revolvers. In a revolver, the chambers of the cylinder are smooth bored and possess no rifling. During the bullet's progress from the chamber to the beginning of the rifling in the barrel, considerable linear velocity is built up. At this point, however, the bullet has no rotational velocity at all. As the bullet enters the rifling, there is a very short period during which the bullet is attempting to catch up with the rifling, for example, travelling along the rifling but with little or no rotational velocity. This results in an observed short length of rifling engraved on the bullet which appears to be parallel with its longitudinal axis. As these marks are more pronounced at the nose end of the bullet, they have the appearance of a widening of the land impression at this point. 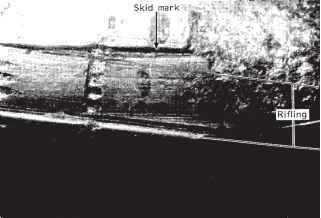 The marks so produced are called skid marks and are a very useful and simple identifier for bullets which have been fired in a revolver (Figure 4.4). This skidding is really a by-product of a problem with revolvers concerning the gap between the barrel and cylinder. This gap not only causes skidding of the bullet, but also allows the escape of high-pressure gases, thus losing some of the potential energy of the propellant. Figure 4.4 Bullet fired from a revolver showing skidding. inside the cartridge case with the case mouth tapering to a smaller diameter than the bullet. When the hammer was cocked, the mechanism moved the whole of the cylinder forward so that the breech end of the barrel actually entered the chamber to be fired. 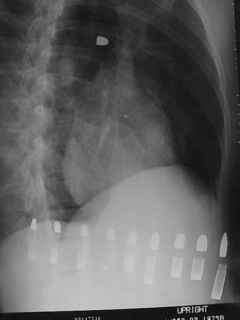 In so doing, the case mouth of the cartridge entered the rear of the barrel, presenting the bullet to the start of the rifling. This was neither particularly good at preventing the skidding nor the leakage of gases. It was also a very complex and expensive mechanism to place in what was a service issue revolver. In self-loading pistols, this skidding is not exhibited to any significant degree as the chamber is the same length as the cartridge case. As a result, the bullet virtually touches the rifling and has very little, if any, opportunity of building up longitudinal velocity without rotational velocity. What are class chaacteristics of a bullet? What some class characteristicof a bullet? What are the class characteristics of a bullet? What are the class characteristics of bullets? What are individual / class charectistics of ballistics? Are muzzle velocities indivual or class characterstics? What are the 2 class characteristics of firearm? What class characteristics of firearms are related to bullets? Is muzzle velocity a class or individual chracteristic?